Q1. How can I use ATLCarService.com to meet my transportation needs? You can use the Request a Quote/Make a Reservation form to Request a Quote, choose vehicles, check availability, make reservations, pay online, and/or request a telephone call-back. Q2. What are your Rates? When you book with us, you can have peace of mind, because we promise there will be NO HIDDEN FEES. The rate you receive from us in your email quote is ALL-INCLUSIVE. Required 20% tip/gratuity and 8% sales tax are listed up-front in advance. We do NOT have any hidden "gas/fuel" surcharges, "time of day" surcharges, "number of passenger" surcharges, or any other hidden surcharges. In addition, if you book a Stretch Limo or Stretch SUV Limo, your quoted rate includes ice and bottled water for FREE. Q4. What is the tipping/gratuity policy? A 20% tip/gratuity is required. Q5. What are the fees/policies for Extra Stops? i. "Hourly" itineraries include unlimited unplanned extra stops, within the booked time period, free of charge. The driver is considered to be "On-Call". a. Extra stops which you specifically mention when you fill out our online reservation form are considered "PLANNED". Such extra stops are INCLUDED in the rate quote which you receive from us by email. 1. The driver reserves the right to decline to make the extra stop. 2. The driver reserves the right to charge an extra fee for the extra stop. 3. The fee for the extra stop is due at the time the extra stop is requested. 4. Fees collected by drivers for unplanned extra stops are NOT considered a tip/gratuity. 5. The fee is left to the discretion of the driver, but is generally as follows, per half-hour period or portion thereof, spent making the unplanned extra stop: $25 (for Lincoln Town Car or 6-passenger Navigator SUV), or $50 (for any other vehicle). Q6. What are the fees/policies for lateness/tardiness by the customer? You may be required to pay a WAITING FEE in order to receive service if you are (A) more than THIRTY (30) MINUTES LATE for your pickup from an airport or (B) more than TEN (10) minutes late for your pickup from any other location. The waiting fee is $50 for town cars, $95 for 10-passenger limos, and $90 for SUVS per hour or fraction thereof. If you are more than SIXTY (60) MINUTES LATE for your pickup, we reserve the right to CANCEL your pickup with NO REFUND. However, please attempt to contact us as we might be willing to give a partial refund in certain situations. Q7. What is the Cancellation/Refund Policy? If you contact us to cancel more than 72 hours in advance, you will be refunded any amount paid minus a cancellation fee. The cancellation fee is $25.00 (twenty-five dollars) or 50% (fifty percent) of the Rate, whichever is GREATER.If you contact us to cancel less than 72 hours in advance, we reserve the right to give you NO REFUND. However, please contact us as we might be willing to give a partial refund in certain situations. Q8. How will I pay for my ride? You pay the transportation service provider who will be servicing your request directly. All service providers accept cash, MasterCard, Visa, American Express, Discover, and PayPal. Credit card transactions can be processed through PayPal to maintain the security of your personal information, or over the phone as well. Q9. May I pay using a PayPal "eCheck"? Yes, however your eCheck must CLEAR at least 3 days BEFORE your pickup date. Q10. Can you call me to remind me of my pickup? Q11. What type of Limos are used for my transportation? Q12. How many people can fit? In general, the number of people designated in the vehicle description can fit. For example, Up to 3 people can fit in 3-passenger Economy Sedans. HOWEVER, if there is a large amount of luggage/ baggage, fewer passengers may be able to fit.There is no additional per-person charge. Q13. When can I book a pickup? You can book your request at any time of the day. However, we strongly recommend that you book a minimum of 24 hours in advance. Q14. When can I get picked up? You can get picked up anytime. We operate 24/7. Q15. What types of itineraries are available? One way & round trips involving airport. One way & round trips not involving airport. NOTE: If you return to your origin within a short time of being dropped off at your destination, and the driver will need to wait for you outside, you will be quoted an "hourly" rate, NOT a "round trip" rate. Q16. Where can I request to be picked up/dropped off? Request to be picked up and dropped off at a specific street address, such as 123 Maple St, or a specific area, such as Hartsfield-Jackson Atlanta International Airport. When booking online, the pickup and dropoff cities can be anywhere in GA, AL, NC, SC, TN. Q17. 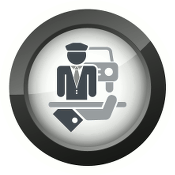 How do Airport pickups work? Driver with sign MEETS and GREETS party at BAGGAGE CLAIM. If the above service is NOT selected, the Party calls Service Provider when ready for CURBSIDE PICKUP. Q18. What flight info should I enter for airport runs? Your Airline, Flight Number, and Flight Time, for example "American Airlines Flight #1020 Arriving @ 5:25 PM". This info is required for Arriving flights and recommended for departing flights. Q19. What is the alcohol/ drug policy? Alcohol consumption or posession is not permitted by ANYONE in the vehicle, if ANY of the passengers are under 21 years of age. Illegal drug consumption or posession by any passenger is not permitted. Breaking these terms is grounds for immediate termination of service for ALL passengers, with NO REFUND. Q20. What is the Lost-and-Found policy? We are not responsible for any baggage, personal items, or anything else left behind by passengers in the vehicle. However please contact us if you have lost an item and we will return it to you if we have found it. Q21. What is the policy on typographical errors with Rates? Your quoted rate is not guaranteed until you pay us AND receive an email confirmation from us stating that the "STATUS" of the Request is "CONFIRMED". (Note: This is not the same as your instant payment receipt from PayPal or other online credit card processors.) This is due to rare typographical errors. Q22. What is the Limitation of Liability? Unless required by law, under no circumstance shall the transportation service provider or any of the other parties involved in the booking be liable to compensate the passenger/customer beyond refunding the full amount originally paid to the service provider. Q23. What if my question is not answered above? © LimoZip | Transportation services provided by ATL Car Service & Limousine & other providers.